CARSON, Calif. (March 29, 2009) - The Los Angeles Sol officially kicked off the 2009 Women’s Professional Soccer season with a 2-0 victory over the Washington Freedom in front of 14,832 fans in the WPS Inaugural Match at The Home Depot Center on the campus of California State University – Dominguez Hills Sunday afternoon. The first goal in club and league history was recorded in the sixth minute of the match, when Los Angeles defender Allison Falk out-jumped a crowd of Freedom defenders in the penalty area to head in a free kick from Japanese national team star Aya Miyama. “It was a great ball from Aya. I just went for it – I didn’t think I was going to get to it, but I did and it went in,” said the rookie from Stanford. “It was a very surreal experience … very exciting." Sol midfielder Camille Abily (France) tallied the second of the afternoon in the 87th minute, taking a short pass from three-time defending FIFA World Player of the Year Marta, and chipping the ball over the hands of Freedom keeper Brianna Scurry. Lady Vikings Head Coach, Jay Fitzgerald will be sending live Tweets from the WPS Inaugural match at http://twitter.com/jatoathletics. 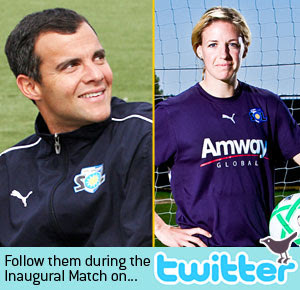 Also,follow Midfielder Aly Wagner at http://twitter.com/alywagner?team=la and LA Sol General Manager Charlie Namo at http://twitter.com/LASolGM?team=la as they tweet live from the WPS Inaugural Match (Sun Mar 29). The new Women's Professional Soccer league will allow selected players to post short Twitter notes, called "tweets," during its inaugural game between the Los Angeles Sol and Washington Freedom on March 29, league communications director Robert Penner said. General managers from the new seven-team league approved the idea in a conference call Friday. Depending on fan response, league officials are considering allowing players to tweet during games all season. They still must work out some of the details, including which players will tweet and when they'll be allowed to do so; starters, obviously, likely would be limited to pregame, postgame and halftime. The first time a women’s professional soccer league launched, it pinned its hopes largely on the girl-next-door appeal of U.S. superstar Mia Hamm. Don’t look now, but there’s a new league at hand and a new superstar at the fore. And she ain’t your mamma’s Mia. A quick search on YouTube will give budding soccer fans all they need to know about the new face of the sport: Los Angeles Sol forward Marta Vieira da Silva, known throughout the soccer world simply as Marta, the 23-year-old Brazilian whipsaw with three FIFA World Player of the Year awards to her name and a world-class collection of embarrassed defenders in her wake. Try to get her to admit that, though – if Marta, who made her first real inroads into U.S. soccer consciousness by single-handedly destroying the U.S. in the 2007 FIFA Women’s World Cup semis, shares a quality with Hamm, it’s her determination to put team first. She may be doing her best not to stand out, but as her highlight reel attests, she’ll have to tie her legs together to avoid it. Her breathtaking blend of speed, vision, agility, and creative fury blazes a neon trail on every field. For a fledgling league trying to get a foothold in a turbulent economy, the pressure would seem to be on its most decorated star to perform. But Marta, who’s had enough to do trying to get used to life in L.A. and the dynamics of her new team, isn’t letting on. 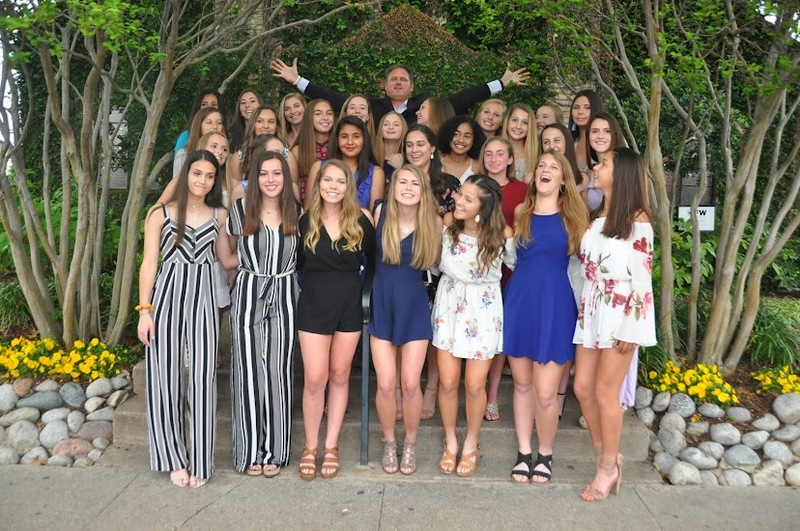 That WPS boasts Marta as one of its featured attractions, alongside U.S. stars like Abby Wambach and Kristine Lilly, underscores the game’s international momentum, which has come a long way from the WUSA’s heavy reliance on home-grown talent. “Marta, Kelly Smith (England national team/Boston Breakers), Formiga (Brazil national team/FC Gold Pride) – it’s so important to have these guys in the league, to let the rest of the world know we’re serious,” Naimo said. Flair will be on full display in Sunday’s WPS opener between Los Angeles and Washington, with bruising Freedom frontliner Wambach providing a neat counterpoint to Marta’s flash. Where are you watching your favorite WPS Inaugural Match? 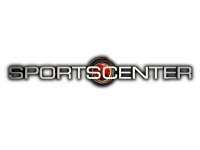 Will you be at home watching Fox Soccer Channel? Will you be with friends and fellow fans at a viewing party in your hometown? Or are you lucky enough to be in a WPS stadium? No matter where you are on game day, we want to hear about it! Take a picture, record a video, or write a message that captures the excitement of your WPS Inaugural. 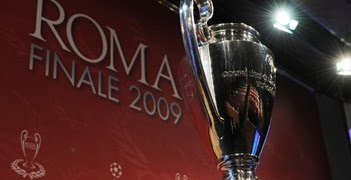 UEFA Champions League holders Manchester United FC will take on 2004 winners FC Porto while Chelsea FC and Liverpool FC are matched again in the quarter-finals after the draw for the remainder of the competition was made today in Nyon. United were beaten by Porto when the Portuguese side won the competition, with the English titleholders aiming to become the first team to successfully defend the trophy since the UEFA Champions League was introduced in 1992/93. The winners of that tie will play the side that emerges from the tie involving Villarreal CF, the only surviving team never to have reached a UEFA Champions League final, and Arsenal FC, the club that defeated the Spanish outfit at this juncture three seasons ago. Chelsea and Liverpool have faced off in the semi-finals in three of the past four campaigns but they meet a stage earlier this time round. The last-four opposition for the winners will be FC Barcelona or FC Bayern München, the two leading scorers in the competition this term with 24 goals apiece. 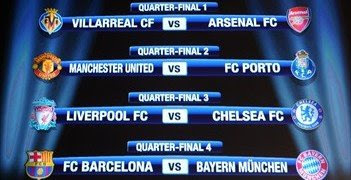 The quarter-final ties will take place on 7/8 and 14/15 April and the semi-finals on 28/29 April and 5/6 May. 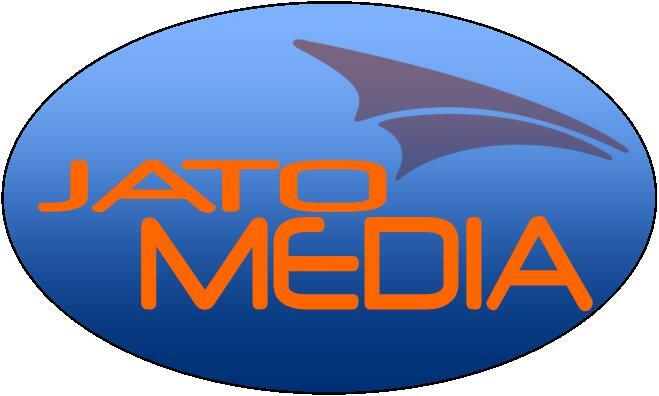 The final will be held at the Stadio Olimpico, Rome, on Wednesday 27 May. For full draw details, including dates, click here. Boxx’s goal came after an intense second half of searching for a tying goal to answer Lotta Schelin’s tally in the 18th minute. The Americans finally got it with seconds left in regulation time. Carli Lloyd slipped past a player in midfield with a nice cut move and played a perfect ball into the left side of the penalty area to the streaking Natasha Kai. The Hawaiian ran the ball down at the end line, but was knocked down by a retreating Swedish defender. From a sitting position, Kai managed to knock the ball back to Megan Rapinoe in the left side of the penalty area. Rapinoe struck a hard cross on the ground through the goal mouth to Boxx at the far post where she slammed it first-time into the net from two yards away. The dramatic goal, the USA’s second 90th-minute score of the tournament, led to an even more dramatic penalty kick shootout. Sweden’s Louise Fors started her country out with a hard shot into the lower left corner. Boxx answered with a perfect blast into the upper right corner. Lisa Dahlkvist also found the lower left corner, setting the stage for Rapinoe, whose driven shot was almost directly at Swedish goalkeeper Kristin Hammarstrøm and she batted the ball away. Linda Sembrandt hit her shot off the left post and in, followed by Lloyd tucking her chance away into the left corner as well to make it 3-2 Sweden after three shots each. The USA then got new life as Anna Paulson skied Sweden’s fourth shot over the bar. The Americans didn’t take advantage as Christie Rampone clanged her shot off the inside of the left post and behind the Swedish ‘keeper, but it didn’t cross the goal line. Schelin then stepped to the spot on her team’s fifth kick with a chance to win the match, but Solo acrobatically pushed her shot away with a full-extension dive to left post. The miss meant that late substitute Tina DiMartino had to convert the USA’s fifth kick to send the shootout into sudden death. DiMartino’s shot was seemingly saved by Hammarstrøm with a dive to the left post, which would have ended the game, but somehow the ball squeezed through the goalkeeper’s hands and rolled across the goal line. Emelie Ölander then blasted her shot over the goal and incredibly, Sweden had missed its fourth, fifth and sixth kicks, giving 88th minute sub Angie Woznuk a chance to win it for the USA. Unfortunately, Hammarstrøm guessed correctly and pushed Woznuk’s shot away with a dive to the left post. Stine Segerstrom then finished smartly into the lower left corner on her team’s seventh penalty and Heather Mitts cracked her shot off the left post and out to give Sweden the victory. Mitts earned her 100th cap for the USA in the match, becoming the 25th female player and eighth defender in U.S. history to reach that career milestone. The Americans had gifted Sweden the lead off a give-away in USA’s defensive third by Boxx, who hit her back-pass too lightly to Rampone and created a 3-v-1 situation. Caroline Seger swooped in to control the ball, dribbled hard at Rampone and then played a pass to her left to the wide-open Schelin. The lanky Swedish striker had plenty of time to pick her corner and rolled her shot into the lower right corner past the charging Solo. It would be the last time Schelin would beat Solo, her former teammate on the Swedish club side Kopparbergs/Goteborg, although she had plenty of chances. In the 24th minute, Sara Thunebro got around the left side of the U.S. defense and cut a cross back to Schelin who was making a hard run to the top of the six-yard box. She swiped at the ball from almost point blank range, but somehow Solo, who was moving across the goal, stuck her foot out and saved the shot. The rebound bounced off the fallen Schelin and over the end line. In the 52nd minute, Schelin was back terrorizing the U.S. defense as she tussled with Boxx on a through ball. Boxx went down, giving Schelin another one-on-one with Solo, but the U.S. ‘keeper flung herself at the ball and gobbled it up as Schelin tried to dribble around her. In the 67th minute, Schelin got behind the U.S. defense once again, but this time Solo held her ground and timed her challenge perfectly, stealing the ball right off her feet. Sweden was certainly the better team in the first half, attacking with fervor and creating a few chances that were either saved by Solo or scrambled away by the defense, while exerting intense defensive pressure in the midfield that precluded the Americans from developing any sort of rhythm. Sweden forward Victoria Svensson did a great job of finding the space between the U.S. midfield and backline, then combining with her teammates, but the U.S. backs held strong after giving up that 18th minute goal. Sweden’s goal marked the only one allowed by the USA in the tournament. The Swedes may also have done enough to win the match in the second half, but the U.S. team never gave up its search for an equalizer while playing much better in the final 45 minutes. Sundhage sent on forward Amy Rodriguez at halftime and moved Rapinoe to the left midfield slot where she created all kinds of danger. Boxx also moved into more of a midfield role. The USA started to make a real push midway through the second half, and Rampone’s run from the back in the 63rd minute almost produced a goal, but her bending ball behind the defense from the left side of the penalty area was just a bit too far for Rodriguez. Three minutes later, Rapinoe slipped a pass through the Sweden defense to the streaking Rodriguez, but she fired her breakaway chance at Hammarstrøm who pulled off the kick save. Three minutes after that, the USA sent a looping ball into the penalty area that bounced hard over the onrushing Hammarstrøm and a defender had to clear it out of the six-yard box with an overhead kick. 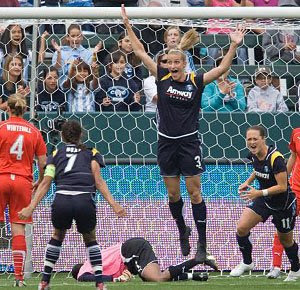 In the 75th minute, Rapinoe was taken down above the left side of the penalty area, but Lloyd ripped her free kick right at the Swedish ‘keeper from 30 yards away. Lloyd had another chance two minutes later as she played a short corner to Rodriguez, got it back as she dribbled centrally and ripped a shot that a Swedish defender headed out of the hands of her own ‘keeper at the left post. Solo had to come up big again with five minutes left as Sweden’s counterattack continued to threaten. The U.S. ‘keeper flew to her left to snag a shot from Madelaine Edlund that could have snuck inside the left post. Solo’s phenomenal performance in her three starts at the Algarve Cup earned her Best Player of the tournament honors. It was first time in 14 Algarve Cups that a goalkeeper has won the award. The USA only had one or two good chances in a lackluster first half, but one came right after Sweden’s goal as Lloyd found a bit of space to win a long throw-in into Sweden’s penalty area. She got a good strike on the ball, but hammered her shot off the legs of Hammarstrøm from about 10 yards away. The match marked the USA’s seventh straight Algarve Cup championship game. The USA won the tournament in 2003, 2004, 2005, 2007 and 2008, but fell in penalty kicks to the Germans in the 2006. The USA won the Algarve Cup for the first time in 2000. The U.S. played without starting defender Lori Chalupny, who missed her second straight game due to illness, but Rachel Buehler filled in admirably at left back. In the other Algarve Cup placement matches, Poland reversed a 5-1 thrashing at the hands of Wales in the final match of Group C play to defeat the Welsh 2-1 and take eleventh place. Norway defeated Austria, 2-0, to take ninth. Finland and Portugal tied 1-1 after regulation before the hosts fell 4-2 in penalty kicks and China PR downed Iceland, 1-0, to take third. A 43rd minute goal from Julie Rydahl Bukh gave Denmark a 1-0 upset win against Germany in the third-place match. 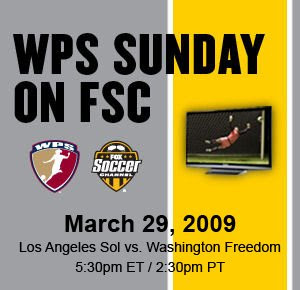 The U.S. players now head back to United States to join their WPS clubs in final preparations for the inaugural season that opens March 29 as the Washington Freedom visit the Los Angeles Sol. The U.S. team will not come together again until this summer for matches that will be announced in the near future. FERREIRAS, Portugal (March 9, 2009) – Forward Megan Rapinoe scored in the 21st minute to give the U.S. Women’s National Team a 1-0 victory against Norway in the final group game for both teams at the 2009 Algarve Cup. The U.S. will face Sweden in the Algarve Cup championship game on Wednesday, March 11, at the Stadium Algarve in Faro. Kickoff is at 4 p.m. local / 12 p.m. ET and fans can follow live on ussoccer.com’s MatchTracker. Sweden won Group A by defeating Germany 3-2 after going up 3-0 at halftime, in a game the Scandinavians had to win to make the title match. The championship game match-up pits U.S. head coach Pia Sundhage against her home country. Coming into the Norway game, the USA had already qualified for the championship by virtue of earlier victories over Denmark and Iceland, but the U.S. put a positive capper on group play with its third straight shutout in a contest that at times turned into a track meet of counter attacks. Norway fielded a squad with several young players and battled gamely for the entire match with the U.S. goal coming slightly against the run of play. It originated from the left wing as midfielder Kacey White took a hard dribble down the flank before playing a threaded pass to Amy Rodriguez at the top of the penalty area. With her back to the goal, Rodriguez spun a first-time pass to Rapinoe, who took a touch to the inside to beat a player, continued for a few more yards and then smashed her skimming shot across the face of the goal, off the left post and into the net. Norwegian goalkeeper Caroline Knutsen almost got a glove to the ball, but the pace of the shot was enough to beat her. It was Rapinoe’s third international goal in just her second start after scoring twice off the bench against Chinese Taipei in 2006. Goalkeeper Hope Solo came up big for USA once again, making an eye-popping save in the 18th minute off a shot from Kristine Lie. The Norwegian forward found space at the top of the U.S. penalty area on the left side and struck a spinning shot that was surely headed into the absolute upper right corner. Solo got a magnificent jump on the ball and executed a fully extended dive to tip the ball over the goal with her right hand. She then punched away the ensuing corner kick. While the game was end-to-end, and the USA did outshoot Norway 12-9, both teams struggled to consistently test each other’s ‘keeper. Norway did have a golden chance in just the fourth minute as Ingvild Isaksen popped free in front of the goal, but shot wide right from 10 yards away. The USA almost made it 2-0 in the 33rd minute as White lifted a looping pass over the Norway defensive line to Rodriguez, who powered through a defender to win the ball, but lifted her shot just wide right of the goal. Lindsay Tarpley, who played in the center of the midfield for the full 90 minutes, had a semi-breakaway chance five minutes into the second half as she ran onto a ball that had been guided on by halftime sub Natasha Kai, but Knutsen got a piece her close range shot to push it wide left. Norway put excellent defensive pressure on the U.S. backs and midfielders, making it very difficult for the Americans to find an attacking rhythm. The U.S. backs were stellar, matching Norway’s physical play for 90 minutes. On the back line, Sundhage gave a first cap to Kendall Fletcher, who also picked up her first yellow card, while Rachel Buehler, Heather Mitts and Christie Rampone ran down every counter attack and battled for every air ball. Shannon Boxx came into the game in the 62nd minute for Mitts as Fletcher moved to right back and helped keep the Norwegian attack at bay. Solo pulled off another top class save in the 83rd minute when Norwegian captain Ingvild Stensland rocketed a shot that forced U.S. ‘keeper to spring straight up and tip it off the crossbar and over the goal. The USA is the only country in the 12-team tournament that has yet to allow a goal. The USA will be playing in its seventh straight Algarve Cup championship game, having won the tournament in 2003, 2004, 2005, 2007 and 2008. The USA fell in penalty kicks to Germany in the 2006 final. The USA won the Algarve Cup for the first time in 2000 and will be going for its sixth overall title. The U.S. Women’s National Team has already advanced to the championship game of the 2009 Algarve Cup with one group match to play, something the team has never done in 13 previous Algarve Cup tournaments, but the final group match still carries some major importance and meaning. It’s against Norway after all. This will be the 45th match between the two long-time rivals, the most for the USA against any country in the world and of course it will be the first meeting since the opening game of the 2008 Olympics, a game which saw Norway score twice in the first four minutes on the way to the 2-0 victory. Of course, the USA famously rebounded from that setback to win the Olympic gold medal, but surely the loss still stings. This will likely be the only meeting between the USA and Norway in 2009 after playing each other three times last year. The match kicks off at 3 p.m. local (11 a.m. ET) live on ussoccer.com’s MatchTracker. The Americans will also have an eye on the Sweden-Germany match at Stadium Algarve in Faro that kicks off at 1:15 p.m. local as the result of that game will determine the USA’s opponent in the Algarve Cup Final on March 11. SAN FRANCISCO (March 3, 2009) – The seven franchises of Women’s Professional Soccer opened up preseason training in the past 48 hours with players reporting for light work-outs and physicals on Sunday and more formal practices on Monday. The month of March will feature more than 20 exhibitions, scrimmages and preseason games involving WPS teams with the highlights including Saturday, March 14, when four WPS teams square off in preseason games and March 21, when four WPS teams will be in action against college and club teams. The first preseason game for a WPS franchise will be Friday’s scrimmage for the Boston Breakers against the University of Connecticut at Storrs, CT. The Chicago Red Stars play in a round robin tournament against Northwestern and Purdue on Saturday, March 7. Chicago Red Stars Head Coach, Emma Hayes prepares her team for the first training session of the Inaugral WPS Season.